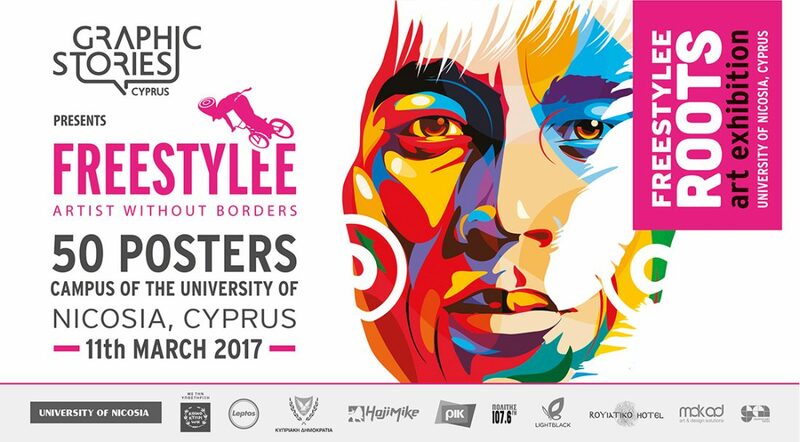 The “FREESTYLEE ROOTS” exhibition will open at 20:30 on the 11th of March, 2017 at the campus of the University of Nicosia in Cyprus. The exhibition is organized in memory of Michael Thompson, his life and work. The Jamaican artist Michael Thompson aka FREESTYLEE artist without borders passed away on the 15th of August 2016. This compelling exhibition features 50 graphic posters designed by Michael Thompson. The exhibition is being organized by Dane S. Thompson, Michael’s son and Maria Papaefstathiou, Michael’s partner, as part of the Graphic Stories Cyprus 2017 event. The exhibition will run until 20 March, 2017. We wish to thank Aggeliki MK Athanasiadi and Miltos Karras, founders of the Graphic Stories Cyprus for inviting and curating the Freestylee exhibition. We also thank Haji Mike for his enormous support and love to Michael Thompson and his work. With his contribution Freestylee will be hosted by the University of Nicosia. Conceived as “ROOTS”, this vibrant collection of posters penetrates beneath the surface, reaching to the foundations of Jamaican culture. The original name of the island, Xaymaca, means land of wood and water in the Arawakan language. The fertility of the Jamaican landscape is matched by the richness of the island’s resilient culture. At the root of modern Jamaica is a history of sustained resistance against forces of oppression. The Taino people fought valiantly against the rapacious European invaders. Later, Africans who were brought against their will to Xaymaca escaped enslavement, establishing Maroon communities in the mountainous interior. In the 20th century, the Rastafari movement emerged as a new wave of maroon-age, with a vision of repatriation to Africa. And reggae music exploded as the sound track of the island’s cultural revolution. This exhibition of Michael Thompson’s powerful posters focuses on two distinct themes. First, there is the celebration of the heroism of the Jamaican people: Queen Nanny of the Maroons, freedom fighter Paul Bogle and Marcus Garvey, Pan-Africanist champion of black people across the world. Jamaican culture in all its dynamism is honored. The second theme of the exhibition highlights some of the festering global problems that need urgent attention. For example, Thompson’s evocative posters constitute creative resistance to the tragedy of war and forced migration. In essence, “ROOTS” presents a substantive selection of Michael Thompson’s politically engaged posters. The exhibition eloquently articulates the artist’s mission to change how we look at the past and the present and how we conceive the future. Affirming the optimism of Bob Marley’s “One Love” message, Thompson’s poster art reaches beyond borders to embrace diverse cultures, establishing communities of empathy.